I once read that in the early days of Grand Canyon tourism, visitors were made to wear paper bags on their heads on their first walk up to the edge. With no idea of the scale of the hole in the ground opening up right in front of them, they were completely overwhelmed when they removed their blindfolds. They were engulfed by the undescribable, and speechless. When I was there, nearly ten years ago, I wasn't too impressed. I knew roughly what to expect. The Grand is huge, deep and mind-bogglingly wide, but it's also static, and pictures convey that pretty well. They don't convey the numbers, but neither do your eyes. How much deeper does a mile look compared to half a mile? So many superlatives are associated with the Grand Canyon that for me, the visit was positively disappointing. I should have hiked down and experienced the depth with my calves. Maybe my judgment would have been different. As it was, I stood at the South Rim wondering what all the fuzz was about. Sure, the canyon is amazing. The colors are splendid and the vastness staggering, but I expected that. That, and a little more, and it was the little more that was missing. Since then, I've been cautious in my enthusiasm for big-name sights. Over the last ten days, I've visited Niagara Falls three times. My first approach was from the Canadian side, cutting through the gaudy madness of Niagara Falls, Ontario, in a coach chartered by the organizers of the conference I was attending. We had a bit more than two hours to spend, not a whole lot even for a casual visit. 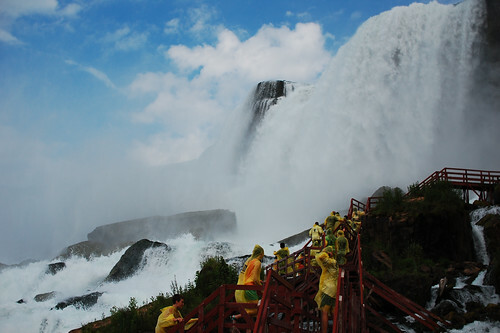 The Maiden of the Mist ride took us to the heaving cauldron at the foot of the Horseshoe Falls. There, the boat just sat, rocking back and forth with great effort. The falls thundered down on us on three sides. The boat's engines were going full bore, but only just matched the force of the water coming from above. We were engulfed in a constantly changing stream of water, sometimes a fine translucent mist, sometimes a torrential downpour. In the quieter moments, I managed to take a few quick shots. In the moments of thunder, I screamed at the thrill, as did everyone else. The ride is well worth the fee, and looking at the falls from the far cliff or walking through the little bit of Vegas that is the town of Niagara Falls only killed time in comparison. Ten days later I was back. Coming up the river from the pretty town of Niagara by the Lake, I decided to forgo the Canadian side and cross over to the US. On the American side, proximal to the falls, at times almost on and under them, I spend last night and today being absolutely amazed. 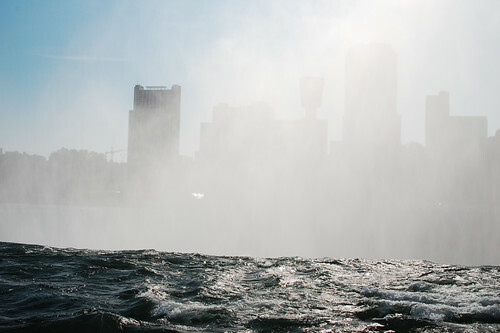 Contrary to what you might believe, Niagara Falls is not overhyped. It is, in contrast, one of those very special places that don't promise anything they can't deliver. There are three parts to the falls. The American Falls and the Bridal Veil Falls, on the US side, are separated by tiny Luna Island. 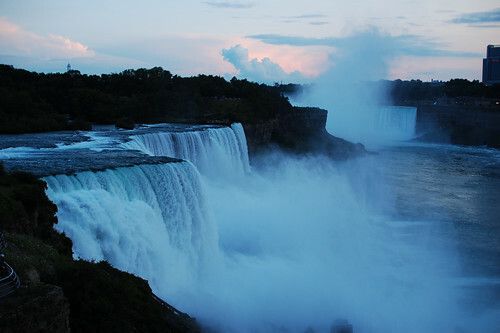 The two falls receive 10% of the water of Niagara River. The other 90% go to the Horseshoe Falls, on the border between the US and Canada. The single best place to experience all three falls is Goat Island, which divides the waters coming down the river. Looking upstream from its tail end, the mighty Niagara seems almost calm. There are a few rapids but the water mostly seems to lie like a thick dark layer of glass. Walk downstream on either side of the island and you'll see mighty rapids. These are especially impressive on the left side, facing Canada. The river looks distinctly whitewater, something you'd have a blast taking a raft down. But something's wrong in this picture. Mountain streams are not normally 300 meters wide. And if you let your glance go further downstream yet, you see a telling line on the water were the river ends and a cloud of white drops hangs in the air, driven left and right by the wind. At times, the cloud comes up high and thick enough to obscure the casinos and hotels on the Candian side. It's from the bottom of the Horseshoe Falls that the cloud rises. Walking further downstream, always just a few feet from the gushing river and not much above the water level, you'll eventually reach the edge. 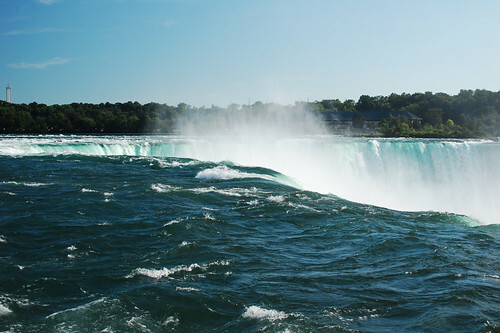 At this point, the full glory of the Horseshoe Falls is to your left, all 750 meters of it. During a summer day, 2.5 million liters of water rush over the lip of the cliff every second. A quick guesstimate on the fly leads me to believe that that's nearly an ocean per year. In any case, it's a lot and much more than can be conveyed in words. The viewpoint is almost within reach of the bulging sheet of water that permanently throws itself over the edge. A bit farther to the right is the entrance to the Cave of the Wind, a walk on wooden planks at the foot of the Bridal Veil Falls. Much like the Maiden of the mist, this is money well spent. You get a plastic raincoat and sandals and the chance to walk very nearly underneath a massive waterfall – and you will get wet. The platform closet to the falling waters is called Hurricane Deck, another example of how marketing can't outdo nature. Standing on the deck is the closest anyone can come to experiencing a hurricane safely. Water is all around you. It drops from 160 feet onto gigantic boulders right next to the banister. It roars, it surges, it pounds, and it screams. It soaks you mercilessly with its spray. It displaces air that sweeps like a tropical storm. It is unbelievable, and quite indescribable. But the best part of the visit is yet to come. Back up on Goat Island, a quaintly arched stone bridge takes the visitor to tiny Luna Island, crossing what looks like a peaceful side arm of the river. After the bridge, it's only a few more steps to the railing. The roar of the rapids and the falls are always audible, but now, it gets louder with every step. Standing at the railing, the American Falls are to your right. To your left, what looked like a tranquil tributary encounters an edge and, unceremoniously, drops, becoming the Bridal Veil Falls in the process. Now lean over the railing. The roar becomes deafening. You are sandwiched, almost within touching distance, by two major waterfalls, and before you is the abyss. Awesome, this most American of words, doesn't do it justice, even though it's the only word that manages, on occasion, to penetrate the noise. Awesome is on everyone's lips, and awe widens all eyes. Mouths agape, people stare at what they see, but their minds don't register it. This experience is out of this world, and there's only one way it could possibly be made better. Next time you're there, approach Luna Island with your eyes closed.